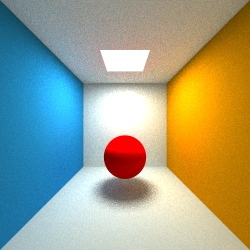 I am trying to implement a simple path tracer with next-event estimation in Java. The general idea is to trace a ray through the scene as usual (using a cosine distribution to determine the next random direction at every bounce), while also taking the direct illumination into account at every bounce. I think I have most pieces of the puzzle available, but I can't fit them together correctly. Here is how I shade matte objects: add the direct illumination to the radiance coming from a random ray (chosen according to a cosine distribution), the latter multiplied by the BRDF. I read Progressive Path Tracing with Explicit Light Sampling | Computer Graphics and thought that I was using the same idea in my code, but I must be doing something wrong, because my images are getting too bright when the maximal path length increases (see the examples for maximal length 2, 4 and 6 underneath). What is the problem? Second, you have a getAmbientReflection() in your direct lighting code—that should not be there for path tracing, where "ambient" light is properly calculated by the recursive trace. Finally, I think the result of your direct illumination path ought to be scaled by $1/π$. This is because the Lambert BRDF is equal to $c_d/π$ where $c_d$ is the diffuse color. The direct illumination path needs to evaluate the full BRDF, including that $1/π$ factor, using the irradiance sample coming in from the light source. However, the cosine-weighted recursive trace does not need a $1/π$, as it is cancelled out by the cosine PDF. That one should just use $c_d$, like you have it. You can check that the $1/π$ factors are correct by checking that the average brightness is equal with and without next-event estimation (keeping the path length the same). BTW, note that the image getting somewhat brighter as you increase the path length is to be expected, as longer paths = more bounces = more illumination. (Russian-roulette path termination fixes this.) 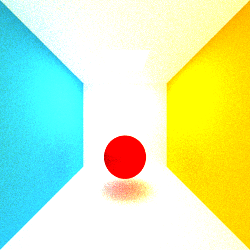 Longer paths will also give stronger global illumination / "color-bleeding" effects. That seems to be what's happening in your images—look at the color of the shadow under the sphere; it gets progressively more influenced by the color of the walls and sphere as you increase the path length. If this is undesirable, try reducing the diffuse reflection factors of all the materials in the scene; they might be unrealistically high, and cutting them down will reduce the bounce light and color-bleeding. Not the answer you're looking for? Browse other questions tagged raytracing pathtracing global-illumination or ask your own question. 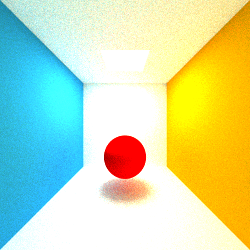 Is it expected that a naive path tracer takes many, many samples to converge?